Mozaffarian, F., Ababzadeh, S., Alizadeh, A., Sharifi, E., Katebi, M., Mohammadzadeh, F., Soleimani Asl, S., Zoalfaghari, P., Soleimani, M. (2014). A Decrease of Reelin Expression in Neonatal Ventral Hippocampal Lesion Model of Schizophrenia. Journal of Applied Biotechnology Reports, 1(3), 121-124. Fereshteh Mozaffarian; Shima Ababzadeh; Akram Alizadeh; Esmaeel Sharifi; Majid Katebi; Farzaneh Mohammadzadeh; Sara Soleimani Asl; Pegah Zoalfaghari; Mansooreh Soleimani. "A Decrease of Reelin Expression in Neonatal Ventral Hippocampal Lesion Model of Schizophrenia". 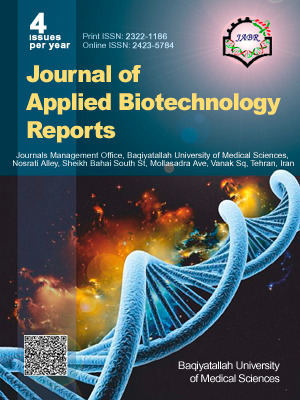 Journal of Applied Biotechnology Reports, 1, 3, 2014, 121-124. Mozaffarian, F., Ababzadeh, S., Alizadeh, A., Sharifi, E., Katebi, M., Mohammadzadeh, F., Soleimani Asl, S., Zoalfaghari, P., Soleimani, M. (2014). 'A Decrease of Reelin Expression in Neonatal Ventral Hippocampal Lesion Model of Schizophrenia', Journal of Applied Biotechnology Reports, 1(3), pp. 121-124. Mozaffarian, F., Ababzadeh, S., Alizadeh, A., Sharifi, E., Katebi, M., Mohammadzadeh, F., Soleimani Asl, S., Zoalfaghari, P., Soleimani, M. A Decrease of Reelin Expression in Neonatal Ventral Hippocampal Lesion Model of Schizophrenia. Journal of Applied Biotechnology Reports, 2014; 1(3): 121-124. Schizophrenia affects 1% of population. Neonatal ventral hippocampus lesion (NVHL) model of schizophrenia designed in 1993 by Lipska and is a widely studied developmental animal model of schizophrenia. NVHL rats mimic many of the symptoms of schizophrenia in detail. We studied this model in molecular level and reelin expression in it. Reelin is an extracellular matrix glycoprotein that regulates some processes in CNS development and reduces significantly in schizophrenia. For this study, animals (male pups) take into 3 groups: control, sham and experiment. The lesion made by injection of 0.3 µl. Isotonic Neurotoxin with stereotaxic surgery in age 7 day and body weight 11-15 gr. Social behavioral and stereotypic movement assessed in age 56 day then reelin expression in frontal cortex evaluated by western blotting. Behavioral analysis and histological studies demonstrated the schizophrenia model. Western blotting of reelin protein in frontal cortex and hippocampus show a decrease of reelin (P value: 0.012) in experimental group as compared to control and sham group. So, in the NVHL as a common and more similar model of schizophrenia reelin expression significantly decreases in frontal cortex and hippocampus that means this model in molecular pathways is similar to the disease.